A Canadian team of Red Cross medical responders is headed into the heart of a humanitarian crisis in Mozambique after a devastating cyclone strike in southeastern Africa. The emergency medical team met in Ottawa Tuesday morning for a day of briefings before the team of 25 travelled to Mozambique in southern Africa. 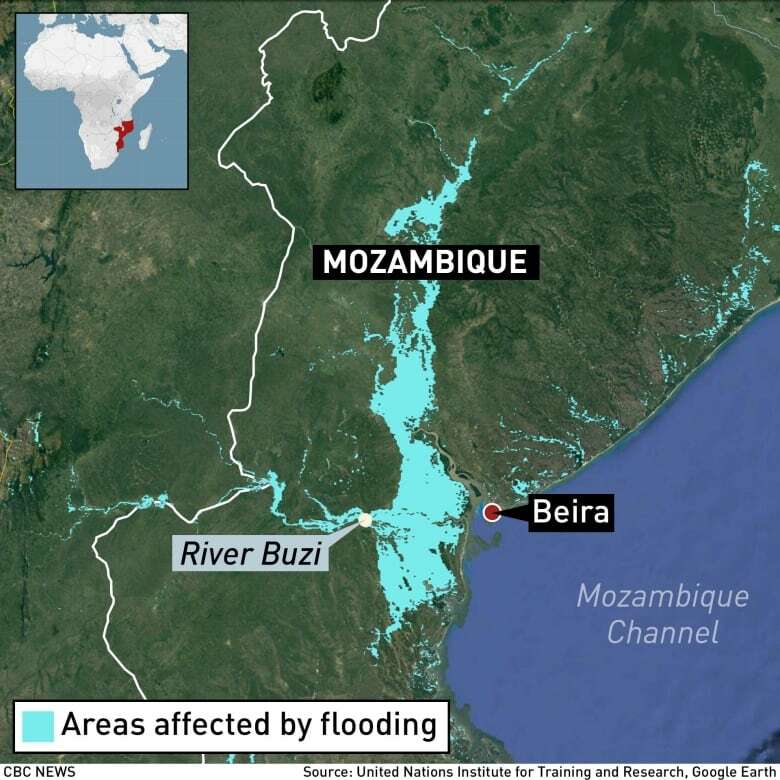 Although Tropical Cyclone Idai tore through neighbouring Zimbabwe and Malawi as well, peaking on March 11 and killing more than 760 people in the three countries,*Mozambique was hit the hardest. The cyclone flattened and flooded communities and left about two million people in the country of 30 million in*desperate need. It's estimated an area of 3,000 square kilometres — about the size of Ottawa — was affected by the cyclone. The Canadian*Red Cross called on Ottawa nurse Jenna Atchison. Within*48 hours she had made arrangements with her family and employer to join the Red Cross's Emergency Response Unit. After working as a nurse in Ottawa and northern communities, and a stint with the Red Cross in East Africa, Atchinson didn't hesitate. *"I didn't really think twice," Atchinson told CBC News. She joined other aid workers Tuesday in a boardroom filled with photos, maps and whiteboards cluttered with logistical information in the Red Cross's emergency operations room in downtown Ottawa. "My focus is really on the people," she said. "I would like to know, if I was in the same situation, that other people and other countries would want to come and help me and my family and loved ones." Atchinson and the other volunteers will travel with just a suitcase of clothes each and a check-in sized black plastic case packed with essentials — food rations, tents, rubber boots, satellite phones and field medicine manuals. The Canadian Red Cross keeps such supply kits ready*for sudden disasters, said Red Cross Senior Operations Manager Chiran Livera. The team will deploy to Beira Central Hospital, where one operating room out of seven is currently functioning,*Livera said. Livera*said he expects the volunteers will be delivering a lot of medical care — including surgeries*— in tents and open-air operating theatres. "Surgical needs are huge," he said. "There's a lot of mothers that are coming to the hospital and they need support. "What's happening is that, in the neighbouring towns and villages, all the district clinics have been affected. And there's additional pressure." Along with the 25 medical professionals, the Red Cross has sent a Boeing 747 jumbo jet with supplies and aid vehicles from Toronto. On Saturday, the Canadian government announced it will provide up to $3.5 million*in initial*emergency assistance to support humanitarian organizations responding to the disaster. Canada*also will be donating relief supplies, including tarpaulins, shelter kits, mosquito nets and blankets. Livera said the Canadian Red Cross's emergency response has committed to remaining in Mozambique for four months, and teams will rotate through one-month deployments. Livera*said he couldn't confirm the total cost of the four-month deployment but, based on previous ones, it could be within the $5 million range. He's calling on Canadians to donate by going to the relief organization's website.